Today’s complex, varied security threats pose a never-ending challenge to cybersecurity professionals, but the advent of quantum computing is about to fundamentally change how we secure sensitive data. What a classical computer takes years or eons to calculate, a quantum computer can process in seconds. Even data that is secured with our strongest PKI is not as safe as we think. We need encryption that can’t be broken, now. 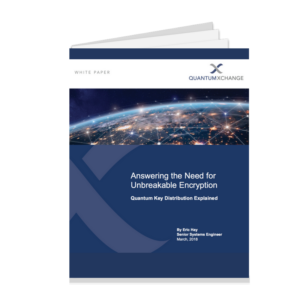 In this whitepaper, you’ll learn about the most complete, secure solution against the threat of quantum computing on the market: Quantum Key Distribution (QKD). Download the whitepaper to learn how QKD works and how it can provide unbreakable encryption today, tomorrow and into the future.